Color-by-number. But I never thought I would see that in a game. Then Chroma Cubes came along. 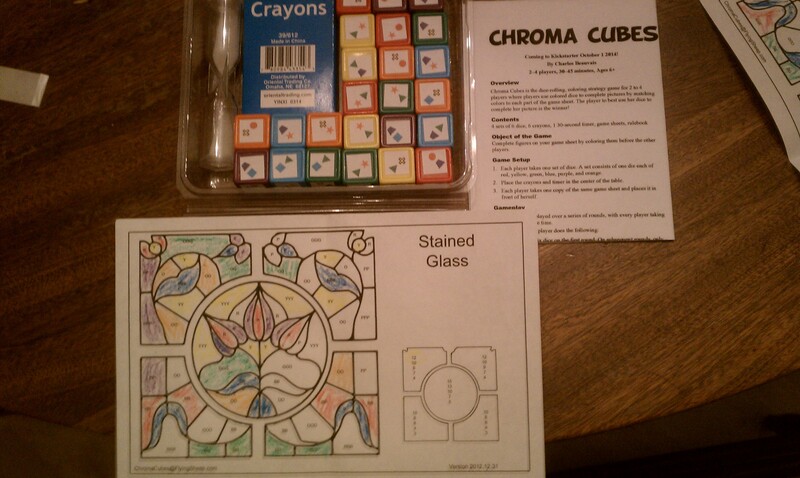 I recently received a copy of Chroma Cubes, the newest game from 5th Street Games. The game was designed several years ago by Chip Beauvais. Chroma Cubes is a very unique game. It has three central mechanics – color by number, dice rolling, and set collection. I know what you’re thinking, crayons, coloring. Really? But stay with me a minute. It will be worth it. What is in the game? Chroma Cubes comes with four sets of six dice in six colors. So six green dice, six red, etc.. Each die has two colors per face. Next, there are the game sheets. 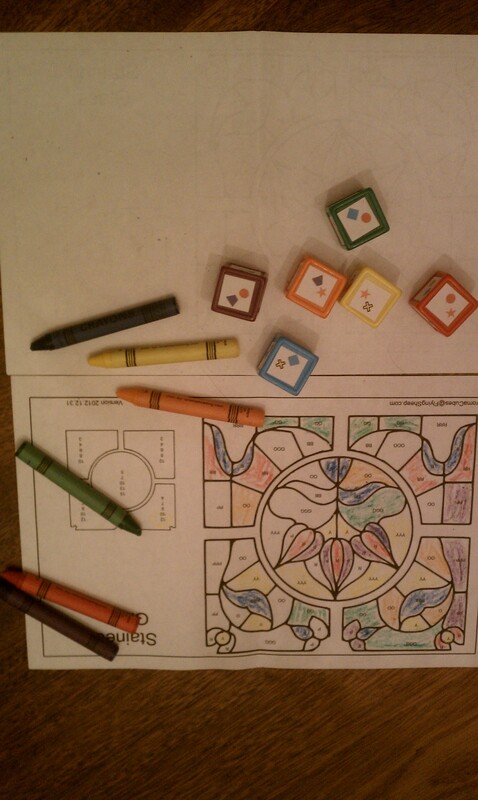 These look like coloring book pages except the spaces are marked with symbols corresponding to the colors on the dice. Some spaces have one symbols. Some have two, some have three or four. The number corresponds to the number of dice of that color needed to color in that space. And there are crayons to match the colors on the dice. Now to how to play Chroma Cubes. Let’s start with the dice rolling. Each player gets one set of dice (one of each color). Players roll their dice and that’s when the fun starts. They then make sets of dice separating by color/symbol on the face. So if you roll red/green, blue/green, yellow/red, purple/yellow, purple/green, and blue/orange you could match the greens, the blues, the yellow, reds, and/or the purples. Once you select your sets you grab a crayon the color of one of those sets and color in one space on your game sheet that corresponds to that color. 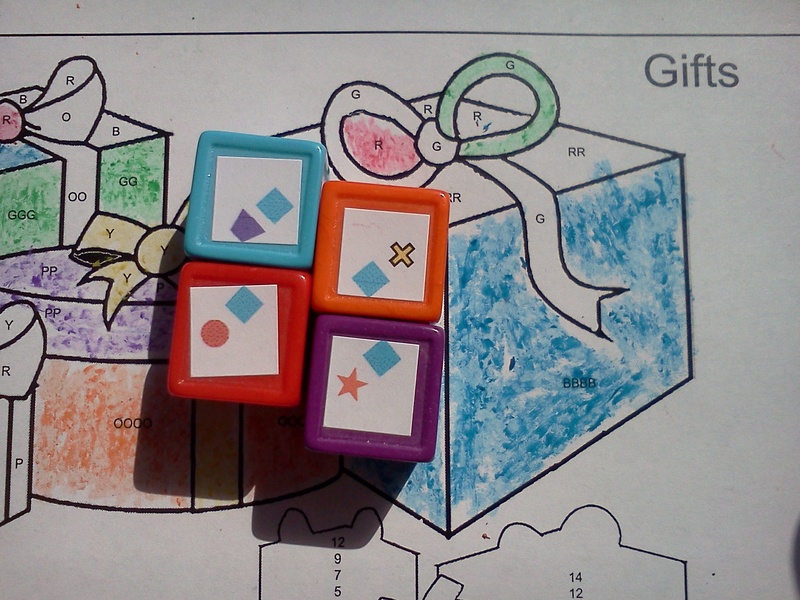 The space depends on how many symbols are on the dice. If there are three green symbols then the player colors in an area with three green symbols. The rolling and coloring continues until someone colors in their whole picture. So it’s a race to complete the picture. And not just that but be first to complete each section. Because the first to score a section scores the most points for that section of the picture. It’s a tiered scoring mechanic that really adds some tension to the game. That sounds really simple. It is. The rules and game play are straightforward and easy to pick up. The 6+ age rating in the game description is accurate. Almost anyone can play this game and enjoy it. As we played I noticed something. This game has strategy! Timing when to color, which sets to make or not, which die to save for the next roll all were choices I had to make. And while they weren’t difficult or hard choices, they were choices none the less. And if you have been reading this blog for a while you know I like having choices in a game. As soon as I realized this my respect for the game went up. The second game was quite good as my opponent and I both began thinking more about what we would color each turn, which dice to use and which to save. Because we found out that those choices can come back to bite you near the end of the game when you don’t have the needed spaces to match your dice. Something else, dare I say ‘emerged’, as we played. This game can be really social because you can trade dice. Yep, if you need a blue and don’t have it but your neighbor does, you can propose a trade. Also, there is only one set of crayons. Often times the other players have the crayon you need right now! So there can be some ‘fighting’ over the crayons. So what do I think of Chroma Cubes? I like it. It has a lot going for it. It is easy and accessible to practically everyone. The rules are clear and understandable. The central mechanic of color-by-number is unique and will appeal to a wide audience. Though gamers may turn their noses up at it. It has dicey randomness. It has set collection. It has player interaction and a great social aspect. I think Chroma Cubes is a lot like The Little Prince. It’s a simple game that can be deceptive, hiding a strategy game behind it’s box of crayons. And that is very cool. 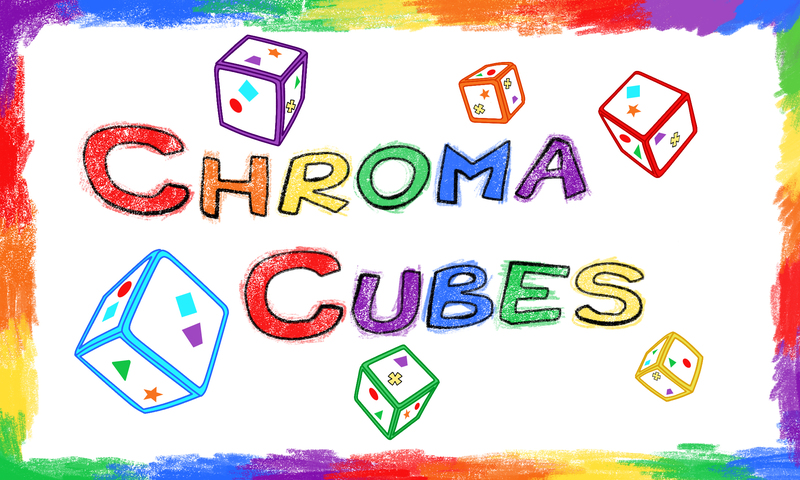 Chroma Cubes’ color-by-number mechanic hides a game with depth and strategy. I went into the first game not expecting to have to think very much. But I was surprised. Planning and strategy abound here. It’s a really fun game on the light end of the strategy game spectrum with enough to satisfy the gamer in me. Support Chroma Cubes right here. Thanks to 5th Street Games for providing a copy of Chroma Cubes for review. Thanks for taking the time to review Chroma Cubes!